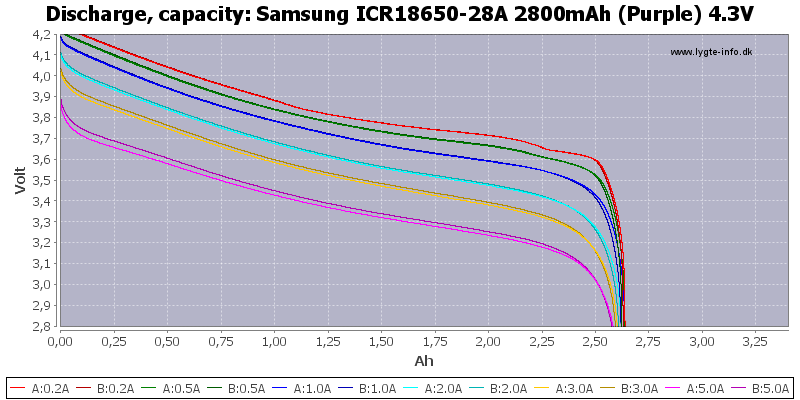 Ye olde purple 2800mah ICR 28A Samsung 18650s. So far I have bought three 6-packs, and all have come charged to a perfectly respectable 2.2-2.54, and all are purple Samsung 2800s as expected. Like all new li-ions, they pop up to about 3.6 or so after about 1 minute in an Intellicharger or equivalent. These are supposedly new, and my tests point to them being just that. Run times are great. And the ones I got hold up nicely sag-wise to the demands of a supposed 4-amp driver on high. If my link doesn’t work right, set your ebay search for “laptop battery 5600 new –charger –adapter,” NO quotes. Packs are the usual thin-wall acer plastic cheapies that disassemble pretty quickly with a minimum of blood and expletives. Unlike other acer packs, these cells are VERY clean with no black goop and clean up quickly with a minimum of elbow grease and NO alcohol in my case. Be sure and use the picture zoom function and check the cell origin (although 2800 Japanese Sanyo or Panasonic made-in-Japan cells would be ducky also). There are quite a few of these 56wh new Acer battery packs on ebay, not all from this seller. I would assume they contain the same purple Samsungs. CHECK THE SELLERS’ FEEDBACK RATINGS. I ++NEVER++ buy anything from anyone with feedback less than 99%. I’m sure I made a mistake some place in writing up this info (And I’m also sure that I will hear about it.) I am in NO WAY in cahoots with the seller. Just got 2 packs. Thanks for the info. Ubehebe, any chance you could measure those cells? I’ve got a Convoy S5 that is super-picky about cell size. Thanks! I am into laptop pulls ever since and I enjoy testing each cell’s discharge capacity in my iCharger. So far I have never encountered any cell that is not flat-top, true 18650 cell, regardless of brand of the pack and the cell inside it. I have some of these cells, it fits. Is the Samsung 3.7v or 4.3v? Nice find Ubehebe. Thanks for sharing. >>>> I’ve got a Convoy S5 that is super-picky about cell size. Thanks! I have the infamous “what-were-they-thinking-making-the battery-tube-so-small” S5, and these batteries fit just fine. However, if you add another layer of shrink tube to protect the original label, they will not fit fine. As someone else mentioned, I too have never seen a 18650 from a major manufacturer that isn’t 18×650. *fire batteries are a different story and come in all kinds of weird sizes. You will need to put a drop of solder or something on the flattop to make it work with some non-spring lights. Magnets are not recommended because they can move around and short out with catastrophic results. Gray Panasonic 2900 18650s BRIEFLY start out with a higher output (according to my rudimentary tests), lux wise, as measured with my meter, but they quickly sag maybe 20%, but hold steady after that. The purple Samsungs initially start at a slightly lower lux output, but stay there just as long or longer than the gray Panasonics. I’m not an HKJ and don’t have any charts to back this up, but I have found that used batteries – even really good used batteries – tend to sag much faster than new batteries, ESPECIALLY with highish amp drivers over 3 amps. These do NOT sag into a quick spiral to low voltages, so I suspect they are indeed new. They also charge up without warming in the least bit, warming being an indicator in my battery farm of substantial use befiore I rescued them from an unexciting life inside a laptop battery pack.
. . . before I rescued them from an unexciting life inside a laptop battery pack. LOL! You'll say anything to justify your battery obsession! Just kidding with ya! >>>>>LOL! You’ll say anything to justify your battery obsession! Just kidding with ya! You mean they really aren’t thanking me in high-pitched cartoon voices when I save them from a life of boredom powering stodgy old laptops? Ummm . . . if you are (or think you are) hearing voices from these batteries I could set you up with an appointment with my wife (she's a Licensed Professional Counselor). Comes in handy having this hobby. Ubehebe, do you charge them to 4.35v? >>>>>Ubehebe, do you charge them to 4.35v? I wish I could …. I suppose if I got a hobby charger or something. Just have a couple intellichargers, plus my “topper,” a cheap one-cell trustfire charger that takes final voltage from about 4.18 volts from the intellicharger to a solid 4.2. Because these 2800 purple Samsungs are supposed to go to 4.35, I think the pink 2600 Samsungs work a wee little better, but they’re hard to find at a cut-rate price like these, so the 2800s do just fine. The absolute best batteries I have found for the smallest sag are Sanyo 2800 cells with the purple ring around the top. Man, those just sit there at say 48k at 15 feet, and sit, and sit. Just fabulous batteries. But these Samsung purples and the Panasonic 2900s are a close second. I’d like to find a similar cheap charger that would go to 4.35v. I’m personally fond of my Sanyo 2600 UR18650FMs, they hang in there pretty well too. Are you talking about the 2900 PD Pannies or the reg’lar ones? Fasttech lists two Samsung 2800 ‘purples’. Note that the links in the above both say “37v”. This is why I asked whether the Samsung in the pack is 3.7 or 4.3. >>>>>>This is why I asked whether the Samsung in the pack is 3.7 or 4.3. Fastech has a bunch of products that seem exactly the same but one will be like two cents more than the other, so I didn’t pay much attention to their specs until you just brought ‘em up. I just assumed that it was one of those deals. But they are definitely NOT the 3000mah purples. I was just reading a Samsung white paper on their li-ion batteries. I’ll see if I can find it, but first off, these cells are definitely the 2.8 amp ones. Wrapper says: ICR18650-28A SAMSUNG SDI 954. Here is the Samsung white paper. Unless I am reading this wrong, which wouldn’t be the first time, ALL 28A Samsungs have a top voltage of 4.3v; 2600s are 4.2v and 3000mah Samsungs (which say “30A” instead of “28A” on the wrapper) are 4.35 volts. That explanation is from a third party I believe. I have been unable to find an explanation from Samsung about what the layer actually does, but I have been busy in the last couple days and haven’t spent more than 15 minutes on digging up the poop on the SFL. As for the color, blue versus purple …. Mine have a purplish tinge to them and are not what I would call a straight light powder blue. They could be called blue I suppose. In any case, in the ones I have seen, the color for the 3000mah is exactly the same as the 2800mah … At least to my eyes there is no difference. But then, maybe there are slight differences in color between batches. I know my Sanyo “purple ring” pack pulls are definitely an orangey color, whereas the Fasttech ones are a more traditional reddish Sanyo color. I am in NO WAY saying that FT sells fake anything, but in almost all cases I would say the chances of pack pulls from a large compnay like Acer are 99.99% likely the “real” thing, and not a duped label wrapped around some Chinese fakery. This is one big reason I like NEW pack pulls better than buying them from any online source as single batteries. On the other hand, these could have been sitting in an uncooled truck container in the Gobi desert for the past year. Of course, the same could be true of any 18650s bought singly too. So just knowing that the battery isn’t counterfeit doesn’t necessarily mean that you’re home free in the condition department. It sure did. You did awful lot of digging! 1. You have to go by what Samsung white paper says, not what FT says. That is 28A top voltage is 4.3v, not 4.2v (3.7v). Since people may be avoiding 4.3v, FT may be pushing 4.3v as 4.2v. only charging to 4.2v the battery loses about 220mAh in capacity. The capacity of pulled cell is 2580mAh, not 2800mAh. 2. As for the SFL, I defer that until you figure it out. 3. Speaking about the color ‘purple’, on my screen, the purple is not purple but a blue with tiny hint of purple. For example, at the FT, the 28A ‘blue’ looks exactly like 28A ‘purple’. 4. As mentioned in (1), I don’t think FT is pushing counterfeit, but merely pushing 4.3 as 4.2 to make it more appealing. Thanks for the wealth of information you researched. Will that also explain why some laptop batt packs are 3-series but is 10.8V and some are 11.1V ? Looks like a good deal for large pack builds. What dates of manufacture are you guys finding on your packs? >>>>What dates of manufacture are you guys finding on your packs? Got me. No date on the pack, and even if there was, that would only be ball park. Date code on the cells themsevles are sometimes three numerals, sometimes four, sometimes alphanumeric. I poked around on the the interwebnet and couldn’t find anything definitive for samsung. Might be in hex format, might not be. First number may be the year; but also might not be. More searching turned this up from a product sheet for the samsung 15q 18650 on how to descipher the date code. Model and Date code Marking : there are three lines on the cell tube as follows. Lot marking : There are two lines on the cell metal can as follows. Some creative guesswork (using ONLY the first three numbers) would mean that 954 is 2009, May 4. Using the first three numbers makes some sense with the description as the fourth number is the reel number (?). Whatever the h a reel number is. Argh! What a PITA trying to decode dates. They must keep changing nomenclature to confuse people. Thanks for the great detective work. Sorry to put you through all that. But I am totally guessing. The thing — to me — that throws the whole thing off is they say the 4th digit in the first line = “Year ( “8” is 2008)” But 4th digit in that line — assuming it’s the “first” line — is +++4+++. That would make it 2004. No way were they making 2800mah li-ions in 2004. Or have I totally bulloxed the whole thing? I just ordered a pack from them for $16. Cells are Korean so we should be good to go. I positively 100% figured out the samsung date code mystery if anyone cares. And I am a dummy. I looked in the wrong place!!! When cleaning up another six cells today, I noticed that there are BARELY LEGIBLE numbers UNDERNEATH the wrapper, printed on the actual metal battery can. DUH!!! as you may remember, that’s exactly what the Samsung date code explanation says: “There are two lines ++ON THE CELL METAL CAN+++ as follows…” DUH!!! The caps are mine. It’s on THE CAN. NOT on the wrapper. Okay, so the last number in the first line is the year. in this case 2009. That’s the important one. These batteries are from 2009, not the best date possible, but not the worst. First digit = 5 is the month, so May. Second digit is “O” (not a zero, but the letter “O”), which is 25 (directions say “E=15, so count up from there: F=16; G=17, H=etc.). So it’s May 25, 2009!!! HOORAY!!! I figured it out. the 3rd, 4th and 5th digits don’t really concern us. But they mean: 3rd digit (serial number of winding = 9); 4th (Reel Number = D); And 5th number is the winder machine used, number 2 in this case. Man, you need a degree in cryptology to figure this out. Wonder how good 4-year old Samsung is. Sanyo Eneloop warranty is 1 year. >>>>>Wonder how good 4-year old Samsung is. Before I knew what the dates were, I took these; put em in a light with a 4-amp driver and shined the light on my lux meter to see how well the light output held up. Did the same with the new 2012 ones from FT. I can see no difference. After a minute, both had settled in at 48k lux and were hanging on. After 30 minutes in my test light …. The 2009 Samsung was actually slightly higher than the 2012 Samsung at 3.94 volts vs 3.89 for the 2012 one. So I am sure there is a difference. How can a 4-year-old battery work as good as a new one? But I can’t see any difference. Maybe they drop in voltage quicker in the lower range that we don’t use in lights? Say, down around the 3.50v area? Got me. Remember now that I have 300 batteries here and have probably processed 500 batteries over the past year, 200 of which I didn’t keep because they didn’t hold a charge or the votage dropped too fast under load. So I kinda have a feeling for bum batteries. As far as I can see, these are not bum cells. But I DEFINITELY would add a YMMV. Maybe I got the three best 2009 Samsung battery packs and all the rest are junk? Be interesting to hear what the others who bought them think. Man, that extra .15 would take some of my lights into the stratosphere, especially the L2s. I can really tell the diff in output in many of my L2s when voltage is 4.2 vs 4.0 and lower. Will most single-cell li-ion lights handle 4.35 volts? I have so many (and also many modded), I wouldn’t even know where to look for trustworthy specs on my lights for top voltage. bdiddle – Youd be overcharging the cells by a good amount @4.35V and with an uncertain outcome. If it were me, Id probably rethink your recharging strategy. Ubehebe – As with all 18650’s, the voltage sag is nearly immediate above 1A, so you probably wont notice any differences. General opinion seems to be that lithium cells usually go around 5 years (if well taken care of) before they might possibly take a turn for the grave. Some go longer, others not. Id say that @$2.68 each, and given Ubehebe assessment, they seem to be a great buy. It would be nice if someone could discharge test a few of these with a hobby charger to confirm capacity. Id love to see a 3A discharge curve.